The virtual reality battle between the Oculus Rift and HTC’s Vive is almost here, but while all the talk seems to revolve around these two headsets, it’s easy to forget about Microsoft’s augmented reality offering - The Hololens. Rumors regarding the device may have dried up recently, but news from the weekend states that the $3000 Development Edition of the headset will be available for pre-order today for an expected launch date of March 30. Microsoft will be providing tutorial videos, documentation, and information to help companies develop Windows 10 apps for headset. Part of the help Microsoft is offering developers will apparently come in the form of three playable Hololens games - Fragments, Young Conker, and RoboRaid - all created by the Redmond-based company. Young Conker brings the titular squirrel from developer Rare's series of games – the most (in)famous being Conker’s Bad Fur Day – into the real world. The game supposedly changes depending on the environment the player is standing in, giving each person a unique experience. RoboRaid, meanwhile, is a first-person shooter that “has invading aliens literally ripping through the walls of the room you’re in,” and uses spatial sound as a gameplay feature. The Hololens Development Edition will also include several non-gaming programs, including HoloStudio, an app that lets developers create 3D resources and teaches them various commands; an enhanced version of Skype that allows people who are running the app on any Windows device to interact with the holographic world; and HoloTour, which can create 360-degree panoramic displays of locations like Rome and Machu Pichu to make users feel like they are there. 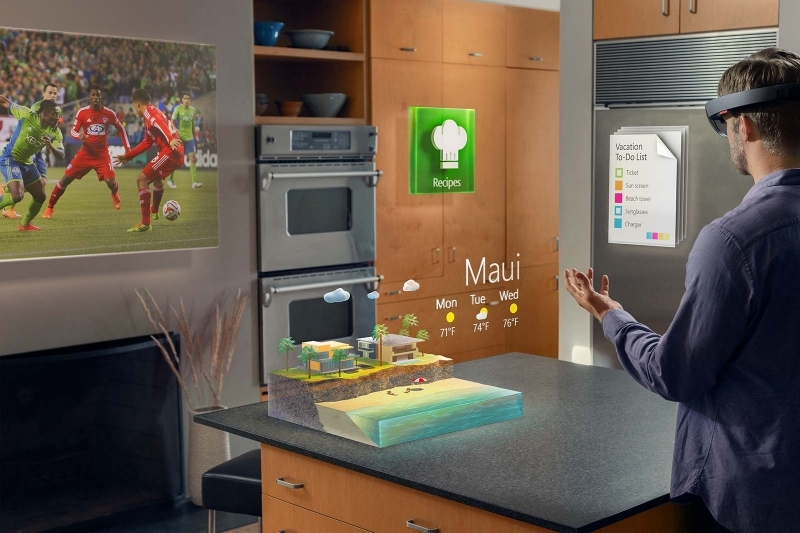 We’ll no doubt learn a lot more about the Hololens at the Microsoft’s Build conference which starts on March 30.